Spring is on its way! 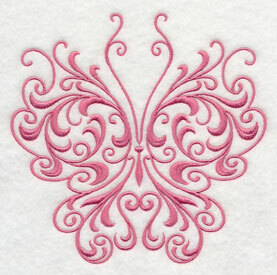 Get ready and warm up today with new dreamy, delicate butterfly designs. 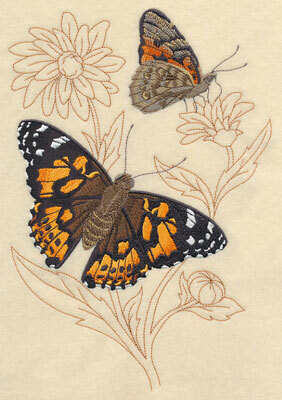 Beautiful butterflies fly onto your projects, bringing a breath of fresh, spring air. Scroll down the page to see an incredible variety of sizes and styles! Butterflies are fascinating creatures, and so very vibrant and colorful. 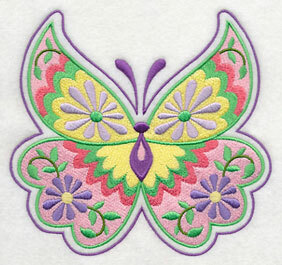 They add a classic and eye-catching look to totes, pillows, mini-quilts, and wall hangings. 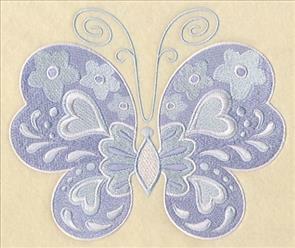 Flutter down the page, and enjoy these beautiful new designs! 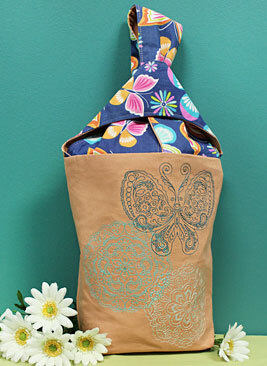 Quick-stitching butterfly designs add a fresh and fashionable look to this bag. Click here for project instructions! 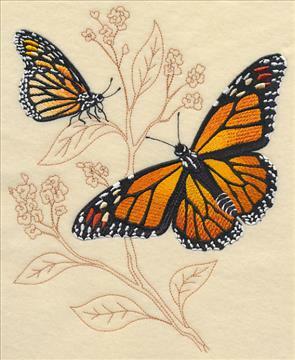 Inspired by scientific sketches, these butterfly designs are stunning additions to quilts, wall hangings, framed pieces, pillows, and tote bags. Full-color butterflies pose against light and open branches, flowers, and leaves. 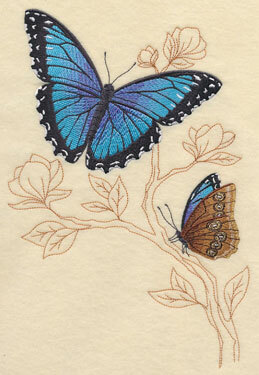 The design on the left features a Blue Morpho butterfly; the design on the right is a classic Monarch. 6.88" x 9.82" and 5.83" x 8.32"
6.89" x 8.57" and 6.26" x 7.79"
5.83" x 7.25" and 4.87" x 6.04"
The left features a Painted Lady Butterfly; the right a Tiger Swallowtail. One butterfly pose shows the impressive detail in the top wings, while the other pose shows the underside of a wing. 6.88" x 9.84" and 5.86" x 8.37"
6.90" x 10.30" and 5.85" x 8.73"
5.23" x 7.80" and 4.60" x 6.85"
The bright and lively Lustrous Copper butterfly is shown left, and the sweet Alfalfa Butterfly is on the right. 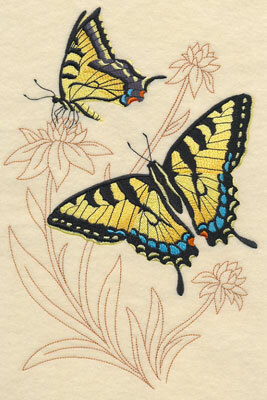 The bright colors in these butterflies are enhanced by the simple stitching of the background elements. 6.88" x 8.59" and 6.23" x 7.78"
6.92" x 9.92" and 5.87" x 8.41"
5.46" x 7.82" and 4.87" x 6.89"
These designs accentuate and celebrate the bright colors and graceful forms of butterflies. 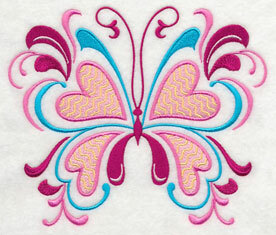 They will bring elegance to any of your embroidery projects! Choose your favorites by clicking the links above, or get all six in a design pack. 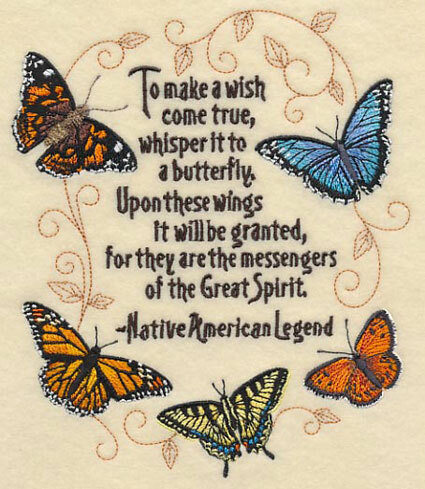 **XL - Designs smaller than 7" x 11.8"
**Lg - Designs smaller than 6" x 10"
**Md - Designs smaller than 7.9" x 7.9"
**Sm - Designs smaller than 5" x 7"
Legend tells us that butterflies carry our wishes, hopes, and dreams, to the Great Spirit. The words of the legend are surrounded by colorful, graceful butterflies. 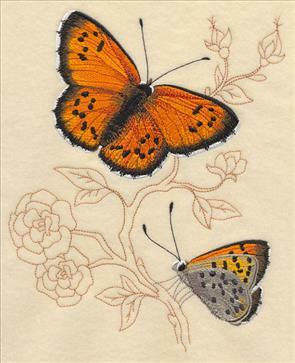 6.64" x 7.80" and 5.90" x 6.94"
Butterflies and flowers in horizontal compositions are excellent for shirtfronts, placemats, bath towels, aprons, and bolster pillows. 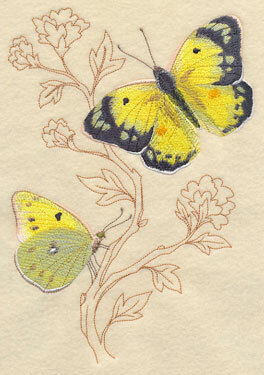 In this design, a tiger swallowtail is flanked by colorful snapdragons. 11.00" x 4.13" and 9.40" x 3.53" and 7.80" x 2.93" and 6.84" x 2.57"
A vibrant King Shoemaker butterfly rests in the middle of day lilies. Beautiful on shirt fronts and jacket backs, as well as tote bags and mini-quilts! 11.00" x 4.64" and 9.41" x 3.97" and 7.81" x 3.29" and 6.85" x 2.89"
A Gulf Fritillary butterfly perches among colorful cone flowers. The orange wings of the butterfly contrast beautifully with the purple flowers! 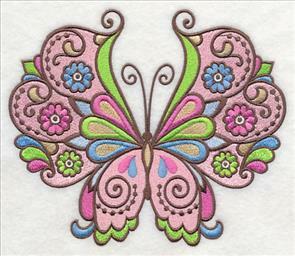 11.00" x 3.51" and 9.40" x 3.00" and 7.80" x 2.49" and 6.86" x 2.19"
Butterflies bring to mind fairy tales and fantasy. These two designs bring dreams to life! 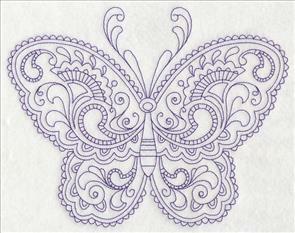 In the design on the left, a fairy flies with a swarm of butterflies. 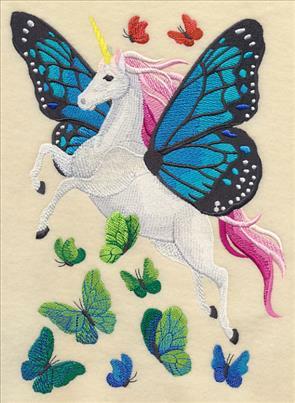 On the right, a unicorn sports a flowing pink mane and butterfly wings. 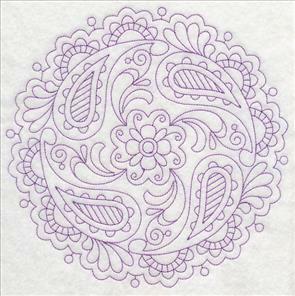 6.89" x 9.45" and 5.69" x 7.80" and 4.86" x 6.65"
Sketch-style medleys are light designs, using shading to bring depth and detail to the design. 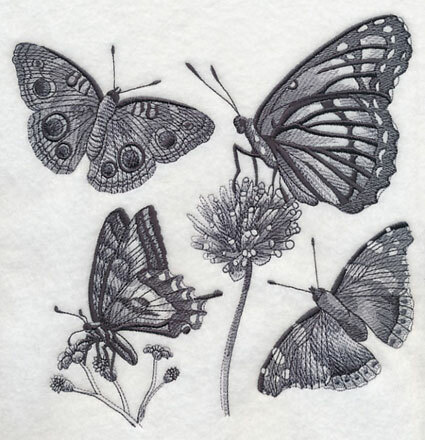 This medley features four different butterflies, in a charcoal colorway. 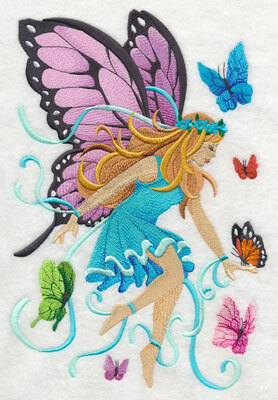 7.78" x 7.80" and 6.88" x 6.90" and 5.86" x 5.88" and 4.87" x 4.88"
When stitching whimsical butterflies, brighter is best! Let your work stand out in a crowd by choosing bold color schemes for these fashionable designs. Sweet daisies fill the wings of the butterfly on the left, while the butterfly on the right has a decidedly retro flair. 6.93" x 5.87" and 5.74" x 4.86" and 3.88" x 3.29"
The butterfly on the left has heart-shaped wings, letting you add a little love to shirts, jeans, bibs, and bags. The design on the right features peace signs and groovy flowers! 8.49" x 5.86" and 6.86" x 4.74" and 3.86" x 2.67"
On the left, hearts and flowers decorate the butterfly wings. 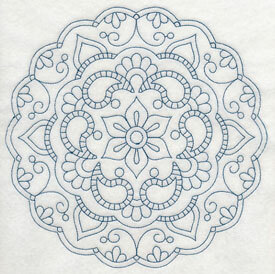 We stitched the sample in cool and dreamy shades of blue. 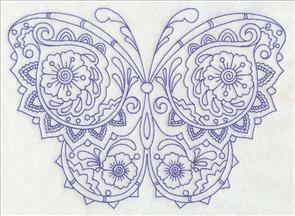 The design on the right features a butterfly in elegant Damask. 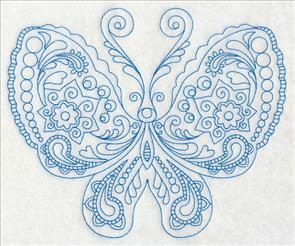 6.04" x 5.87" and 5.00" x 4.86" and 3.87" x 3.77"
Capture your favorite butterfly designs by using the links above. Or, get the whole flutter in a design pack. 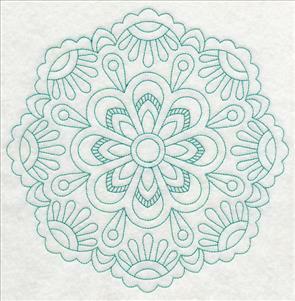 **Md - Designs smaller than 5" x 7"
**Sm - Designs smaller than 4" x 4"
Mehndi designs are inspired by Hindu art. The art is recognizable by its intricate, small detail. Henna paste is used to draw the art onto arms and hands for special occasions. 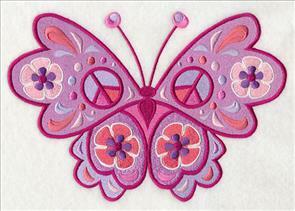 The designs below are butterflies and medallions inspired by this beautiful art form. You'll see classic India images included as well, such as paisley and flower forms. 8.76" x 6.90" and 7.43" x 5.85"
8.70" x 6.33" and 7.40" x 5.38"
6.16" x 4.48" and 3.85" x 2.80"
These designs use only one color thread, and are quick to stitch. 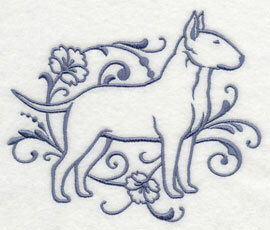 Add them to quilt blocks, table linens, tea towels, and t-shirts. 8.31" x 6.90" and 7.04" x 5.85"
7.80" x 7.72" and 6.97" x 6.90"
5.91" x 5.85" and 4.90" x 4.85"
Medallions are beautiful on quilt blocks, curtains, and tea towels. The light and open areas make these designs excellent choices for smooth, neutral fabrics. 7.80" x 7.74" and 6.95" x 6.90"
5.89" x 5.85" and 4.87" x 4.84"
7.80" x 7.80" and 6.90" x 6.90"
5.85" x 5.85" and 4.85" x 4.85"
too! 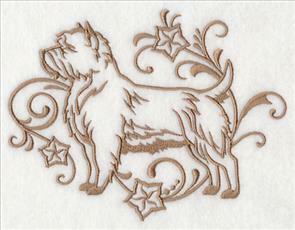 Our request list has been jam-packed with suggestions for more breeds in the quick-stitching "graceful" style. Robyn wrote to request her two favorite terriers. Thank you, Robyn, for the request! 6.32" x 4.86" and 3.87" x 2.97"
a popular program, and designs are scheduled through the end of 2015 and beyond. But we still want to read your ideas! Send them to support@emblibrary.com. We'll add them to the list of designs to be created!